I do love Baduzzi, after 3 visits I still want to back for more....of just about everything. Meatballs are star but then everything else is just a tempting & delectable. It’s run by the same team as The Grove so they know exactly what they are doing & it the most welcome addition to Wynyard Quarter. Step in through the bright red door, settle in & enjoy! Baduzzi is the Sicilian word for meatballs & there are some very tasty morsels to choose from. Crayfish meatballs with braised chickpeas, heritage tomato & basil or grilled wagyu meatballs with onion gravy, salsa verde & cannellini beans or wild red deer meatballs with portabello mushroom & cauliflower crema. The other Monday night we had the crayfish & wagyu & were not disappointed....these are melt in the mouth delicious. Much as I love the meatballs I love the past even more! My special favourite the saffron gnocchi with goats curd, burnt butter, almonds & marjoram. What’s not to love about pasta & burnt butter, well actually anything with burnt butter! Add to that the sharp goats cheese & I am in heaven. We also had the rabbit ravioli, plump ravioli packed with rabbit meat are rich & comforting. We also tried the insalata of white beans, squid, lemon juice & parsley. Perfectly grilled squid & wonderfully bright & fresh salad. And then there are desserts! I have had the tiramisu on a previous visit...just have it. Rich & creamy...No matter how full you think you are you will thank me...I promise! The chocolate torta caprese with vanilla ice cream is rich, dark & decadent. Served warm with an ooey gooey centre if you love chocolate you will adore this dessert! Baduzzi from beginning to end is just a delight! 10-26 Jellicoe St, North Wharf, Wynyard Quarter. They say good things come to those who wait & that is definitely true of this bread, no no knead, bread ready in an hour here. This is a 24 hour job but it is so worth the wait. Ever since getting the Green Kitchen Stories cookbook this one was calling me. I have actually had the ingredients waiting in the pantry for a weekend when time was on my side. And this weekend just gone I did have a little time. It’s not difficult, it is just like a lot of really good things it takes a little time….step by step...they do say patience is a virtue. *So I had rye flour....& 400g was way more than 2 2/3 cups! But the dough seemed to be the right consistency so I just carried on! And for the second round I just added less spelt flour. I didn’t have whole & light & so just used regular spelt flour. Place the rye grains & sunflower seeds in a bowl & pour over the boiling water. Let it sit for 15 minutes, then add the yoghurt, honey, sea salt, fennel seeds, cranberries & carob or cocoa powder. Stir with a wooden spoon until well combined. Test the temperature with your finger; it should be just warm. Stir in the yeast & then add the rye flour & stir until you have a smooth batter. Cover the bowl with cling film & leave for 1 hour at room temperature or until the yeast has worked it’s magic & the dough is slightly bubbly. Gradually add in enough of the spelt flour to form a dough that you can turn out on to a floured work surface & knead for 5 minutes. Add more spelt flour until the dough becomes firmer. It will be slightly sticky but quite heavy. Form it in to a ball & place it in a clean oiled bowl. Slap some water on the top with your hands. Cover with clingfilm & chill for 8-10 hours....this is where the first round of waiting comes in. Place the dough in a 1kg (2 1/4 lb) oiled loaf tin & press down with your fists to get rid of any air pockets. The dough should be quite sticky. Brush the top with water & dust with rye flour. Cover with a kitchen towel & set it aside to rise for slightly for 2 hours....round 2 of waiting. Pre heat your oven to 200C / 400F. Place the loaf in the oven on the lowest shelf & bake for 1 hour. After an hour turn off the heat & leave the loaf in the oven for a further 15 minutes. Remove from the tin & leave to cool on a wire rack for at least 4 hours....I know, very hard not to cut a slice of bread just out the oven to slather with butter! But the wait is worth it & it is important to allow the bread to set which makes it easier to slice. Place in an airtight container it will keep for a week. This is good bread, well actually better then good. A little heavy & full of substance & sustenance it leaves you feeling satisfied & nourished. They say the cranberries are optional but I would definitely include them, those little bursts of fruit just add more texture & flavour. What I do love about Donna Hay recipes is that they are so adaptable, easy to tweak & change to suit yourself. For me that is a sign of a a good recipe. I prefer them more as guide rather than list of hard & fast rules & ingredients. This week’s theme at I Heart Cooking Clubs is tarts; now I love a tart but with Summer & beach time fast approaching I am in the need of a lighter tart! So this zucchini & feta tart with filo instead of puff or short crust pastry hit the spot. *I switched out the goat’s curd for feta as that was what I had. I also used a tray half the size so pretty much changed all the quantities! So And I added a little lemon zest & chilli....they just work such a treat with feta & zucchini. Brush the base of a 15cm x 40cm tart dish or baking tray with melted butter. Layer with filo sheets, brushing with melted butter between each layer & leave a little of each sheet over hanging. Top with the grated zucchini. Place the eggs, cream, lemon zest, chilli, salt & pepper in a bowl & whisk until well combined. Carefully pour over the zucchini and top with the crumbled feta. Crumple up the edges of the over hanging filo to make a little crust & brush it with a little of the melted butter. Place on a baking tray & bake for 30-35 minutes or until just set. Allow to cool slightly before slicing. This was a light & fresh take on a tart....ticking Donna’s fast, fresh & simple mantra. The chilli & lemon zest definitely adding a little heat & brightness so would most definitely recommend their addition. If you like a tart….you'll find more here. Well not quite pear belle helene & not quite pavlova, but some sort of deliciousness in between. I am more of meringue person so like my pav a little chewy & crunchy & little less marshmallowy, so my pavs tend a little towards a giant meringue! The favourite dessert of last summer was this brown sugar pavlova with whipped cream, raspberries & salted caramel sauce. Mound everything on top & let everyone just tuck in & help themselves...it went down a treat. I wanted a little variation, but still a craving for some salted caramel & came up with this pear, chocolate & caramel concoction. Pear Belle Helene, or Poire Belle Helene if we are being all French, is traditionally pears poached in sugar syrup & served with vanilla ice cream & chocolate syrup so I have taken a few liberties...it was the pears & chocolate that inspired this dessert. They may not be quite the classic beautiful pears but they were very, very good! Makes one large pavlova & 8 dinner guest & neighbours scoffed the lot! *Severe Warning: This sauce is highly addictive after just one hit! Pre heat your oven to 140C (no fan bake) / 275F & line a baking tray with baking parchment. Place the egg whites in the bowl of a mixer & beat until you have stiff peaks & then gradually add the sugar. Keep beating until the sugar is completely dissolved. To check just rub a little meringue between your fingers. If you can still feel grains, beat a little longer until it feels completely smooth. Add the corn flour*, vinegar & vanilla & beat on low until all incorporated in to the meringue. *If like me you like something that is somewhere between a pavlova & a meringue reduce the cornflour; I added 3 teaspoons. Not quite smooth enough…keep beating! Now this is a rustic pavlova; so gently turn out the meringue on to the baking tray & make a rough rectangle with swirls & peaks & troughs...all the better for holding all those lovely toppings. Place in the oven & cook for one hour. * Allow the meringue to cool completely before assembling & serving. While the pavlova is cooking make the salted caramel sauce. Place the butter, sugars, syrup & butter in a small saucepan over a medium low heat to melt. Once melted simmer gently for 3 minutes, stirring now & again. Add the cream & half a teaspoon of salt & stir again. Taste, carefully as it will be hot! Add more salt if need be & cook gently for another minute. Et voilà, that is it. In a matter of moments you will have what is the most addictive sauce. I find if left on the stove top it is almost impossible not to just have a little taste every time I walk by. *Again if like me you prefer a slightly “failed” pav with a little more crunch & a little more chew & little less marshmallowy just cook for a little longer, 5-10 minutes more. To assemble place the pavlova on a large platter or board, mound on top the whipped cream, scatter over the pears, drizzle generously with the salted caramel sauce & the melted chocolate. Take to the table & let everyone dive in & help themselves. 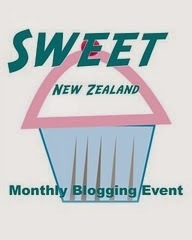 This is also my entry for this month’s Sweet NZ being hosted by me 😊 All details here if you have some sweet treats! Asparagus, how I love those tender green spears. They’ll make at least one appearance a week at the dinner table until their season is over. They are not happy travellers so I always like to make the most of always too short season. And I always like to find some new ways to cook with them. This week over at I Heart Cooking Clubs it is all about in season, so asparagus was an obvious choice. Even better this another fast one! Preheat a char-grill pan over high heat. Brush the asparagus with oil & sprinkle with salt & pepper. Cook for a few minutes, until just charred. Allow to cool slightly & roughly chop. Place the asparagus in a food processor with the oil, parsley, garlic, anchovy fillets, parmesan, lemon zest & juice, salt & pepper & blitz until roughly chopped. Set the pesto aside. Cook the pasta in a large saucepan of salted boiling water for 8-10 minutes or until al dente, with a little bite. Drain the pasta & reserve about 1 cup (250ml) of the cooking liquid. Return the pasta to the saucepan with the pesto & reserved liquid & toss to combine. Divide between plates & top with a little extra sprinkling of parmesan & cracked pepper to serve. 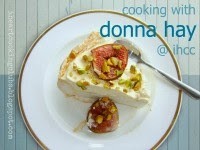 Another speedy & tasty supper from Donna Hay & perfect for this weeks I Heart Cooking Club's In Season theme. This one is bright, fresh & satisfying, the char grilling adding a wonderful smokey sweet note. This week over at I Heart Cooking Clubs we are all about the sandwich. Who doesn’t love the versatile sandwich? I am certainly partial to that classic the cucumber sandwich & a personal favourite would be an egg mayonnaise sandwich. Perfect egg mayonnaise, so more egg than mayo & well seasoned with salt & a good dose of freshly ground black pepper for me. The freshest white bread & butter also requisites to make it the perfect sandwich. That brings me to another favourite; the bacon sandwich which also needs the freshest white bread & butter encasing crispy bacon. This week I thought of maybe some sort of wrap or some sort of open sandwich & then I stumbled upon these bruschetta. an Italian appetiser consisting of toasted bread slices drizzled with olive oil & usually topped with tomatoes and basil. a sandwich served on only one slice of bread, without a covering slice. So I reckon that means this bruschetta come crostini qualifies as a sandwich for this week’s I Heart Cooking Clubs. It really is just one without a top, which is why this one caught my eye. Fresh bright pale green circles of zucchini flecked with red chilli, chives & lemon zest was just the ticket for a bright, fresh Spring supper. Reading further these were scattered over crispy grilled bread & feta & I was sold. *these were originally bruschetta, I made them crostini & rubbed them with a little garlic before char grilling rather than raw garlic in amongst the zucchini . I also added a little mint as it works so well alongside the zucchini & used a little less oil. 1 French baguette, sliced on an angle. Place the zucchini, chilli, garlic, chives, lemon zest, salt, pepper and oil in a bowl and mix to combine. Rub the garlic clove over the bread & drizzle with a little olive oil. Char grill stove top or pop in a 180C/350F oven for 10 minutes until golden. Top the bread with the feta & the zucchini mixture to serve. Et voila, a quick, bright & fresh supper on the table in moments. The crispy bread wonderfully crunchy & the creamy, salty feta the perfect foil for the zucchini herbs & chilli. As little crostini these would be the perfect nibble for a summer BBQ. For more sandwich inspiration head over here.